My husband is to thank for this Chocolate Cake with Fluffy Peanut Butter Frosting. Blake is a chocolate and peanut butter fan through and through. So it just didn’t seem right to make him a birthday cake that was anything but. The cake is a mish-mash of a few of my favorite recipes. The chocolate cake Mom always made for birthdays growing up, my favorite fluffy peanut butter frosting, and a silky fudgy glaze of chocolate frosting on top – there is no way this cake could disappoint someone so devoted to the chocolate and PB combo! Layering up this cake is a fun ordeal. 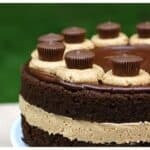 I love the thick stripe of peanut butter frosting running through the cake’s belly. Then the glossy chocolate frosting swirled onto the top adds a bit of shine, plus another texture and flavor of chocolate. When I piped the peanut butter frosting circles onto the top, I was at first disappointed in their crackly appearance. 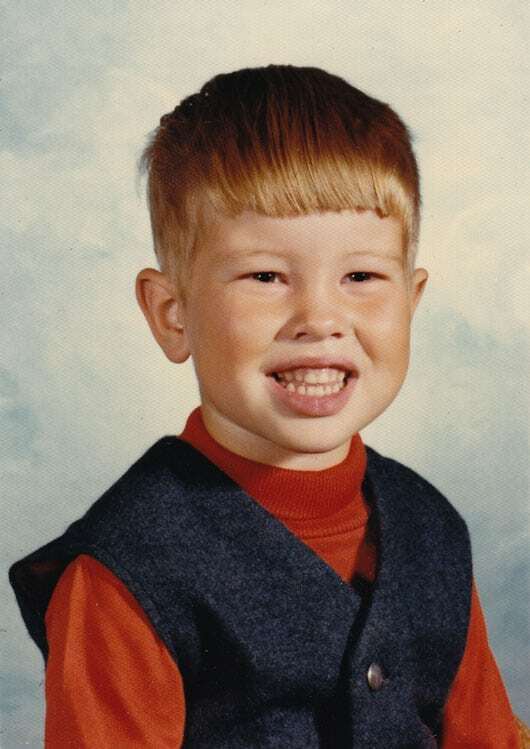 But then those little imperfections became endearing to me, reminding me of an old fashioned peanut butter cookie. So I topped them off with little peanut butter cups, and that was that! Happy, Happy Birthday, dear Blake! Prepare two 9″ round cake pans. Grease the pans well, making sure you cover the entire interior surface. Cut two pieces of wax paper and fit one inside of each pan. Set aside. Measure all dry ingredients into bowl and whisk to combine. Make 3 large holes in the dry ingredients. In a separate bowl, combine salad oil and vinegar. Pour this into the 3 holes. Pour the water over entire mixture. Mix with a fork. Add vanilla and stir. Divide evenly into the two cake pans. Bake for 25 to 30 minutes, removing from the oven as soon as a toothpick comes out clean. Let cakes cool in their pans on a cooling rack for 5 to 10 minutes. Then run a thin knife around the edge of each pan and invert the cakes onto your rack to cool. Let cool completely before assembling cake. Mix milk and sugar in small saucepan. Add butter. Bring to a boil over medium-high heat and then remove pan from heat. Add chocolate chips to the pan. Using wire whisk, mix until smooth. If frosting is too thick or grainy, add up to 1 teaspoon of hot coffee. Place one layer of chocolate cake on a plate or serving platter. Fit a pastry bag with a large plain tip (I used Ateco #808) and fill with Fluffy Peanut Butter Frosting. Pipe a thick line of frosting around the top perimeter of the cake layer on your plate. You want the frosting line to be somewhat hefty, and to bulge just slightly outside of the cake’s perimeter. Then fill the inside of the frosting circle with peanut butter frosting from your pastry bag. Smooth out the frosting with an offset spatula or knife, being careful to not push the frosting out over the edge of the cake. 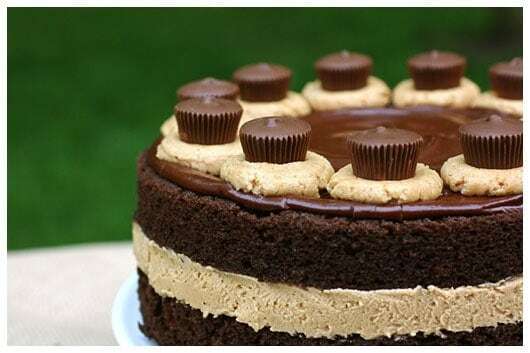 Place the second layer of chocolate cake on top of the layer of peanut butter frosting. If needed, fill in the frosting gap between the cake layers with an additional piping of frosting, somewhat “smooshing” it in as you go around the cake, to give a flattened look. If you already have enough frosting bulging out from between the cake layers, simply “flatten” it out by running the long side of an offset spatula or knife carefully around the cake’s side, flattening the frosting as you go. 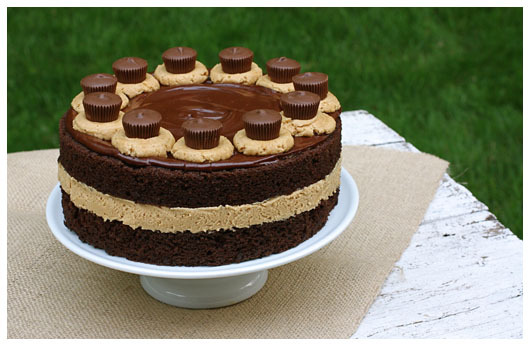 Once the chocolate frosting is set, pipe 10 to 12 circles of peanut butter frosting onto the top perimeter of the cake. I used the same Ateco #808 tip for this. Then top each circle with a small peanut butter cup. Chocolate Frosting: adapted from the Famous Turtle Cake at Cafe Latte in St. Paul, MN. I shared this fabulous cake here.